Ireland’s Largest Beer Cooler Installation – 192 Beer Taps! The Russel Court Hotel Complex in Dublin recently installed four VS beer coolers making it one of the largest integrated beer cooling installations in the country and the largest VS cooler installation ever completed. Since the introduction of the VS Variable Speed energy saving beer cooling system earlier this year we have had the cooler installed in hotels nationwide, from Donegal to Cork, several in Clare and Limerick and quite a number in our own home town of Kilkenny including the famous Village GAA Club, Cleere’s Theatre and the brand new Front Room Pub to name but a few. The product has proven itself to be a phenomenal success in 2016 and a great addition to our range. The largest installation in the history of the VS beer cooler product took place late last year (2016) in the Russel Court Hotel complex, which consists of a hotel with bars and a number of busy nightclubs all under one roof. Dicey’s Garden, Krystle Nightclub, and Bond Nightclub are all well-known names on the Irish entertainment scene. What many people do not know however, is that the draught dispense setup for these venues is consolidated into one highly efficient centralised dispense system, which features the latest in Variable Speed pumping and refrigeration technology to minimise running costs – saving the businesses thousands annually. At the heart of this installation is a set of 4 no. brand new 48 track Kilkenny Variable Speed [VS] beer Coolers which cool many thousands of pints per hour during busy periods – serving perfectly chilled beer to almost 200 taps simultaneously! The equipment had to be specially configured for the job, due to the scale of the project. The refrigeration design featured cutting edge equipment and the design represented the very latest thinking in energy efficiency – consolidating the fridge plant for several elements into one large variable speed unit – slashing running costs in the process. 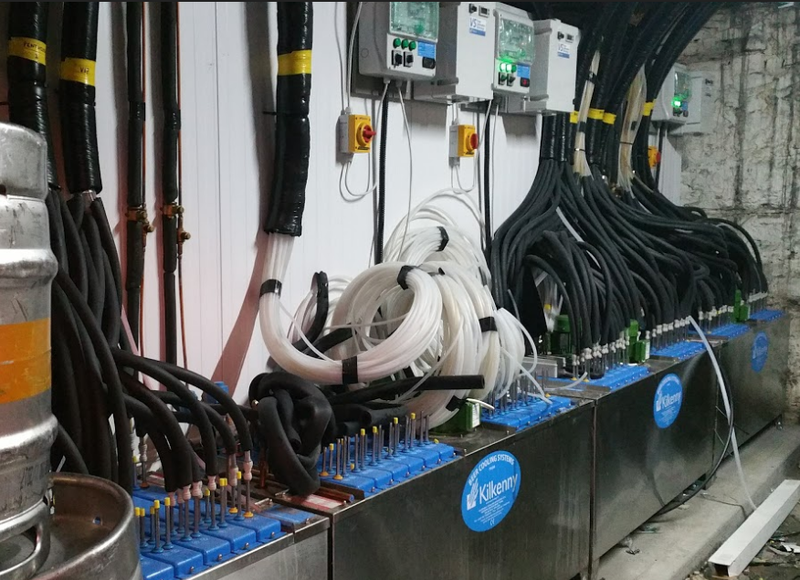 For more information on the Kilkenny Cooling System beer cooler or to learn more about how Variable Speed (VS) beer cooling technology can save your business money, please get in touch.